Let’s talk about the infamous equivalence of Dutch food culture: Bitterballen. Don’t worry, I will not talk about calories, that would be flat out mean. Also, for all you Dutch people out there, keep calm, I do actually like them and I freely admit that I will need to enhance my culinary skill set as soon as I leave the Netherlands, as I do not want to miss out on Bitterballen. Now, ever since I’ve stepped foot in this flat little country, Dutch people keep telling me to eat Bitterballen. In pubs, in bars, in restaurants, even at University they will tell you that “in the Netherlands, you just have to try Bitterballen”. Obviously, they seem to be the pinnacle of Dutch food. If you never had them, let me explain: They are not bitter. They are, however, ball(en)s. Fried balls. What kind of balls, you ask? Well, here it gets tricky. 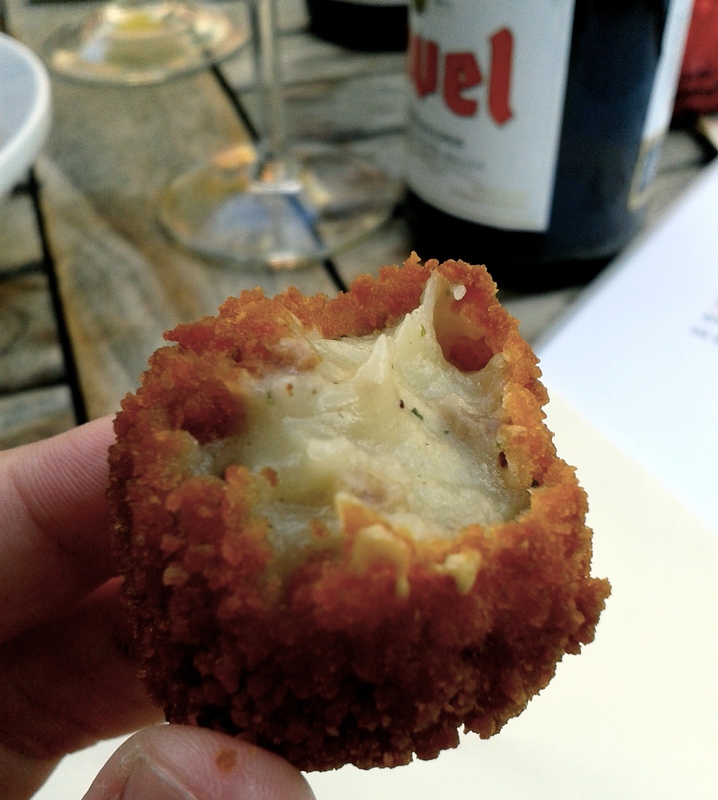 Most will advertise Bitterballen as “some kind of meetball”. Let me assure you, they are not. At least if you expect your meetballs to have a certain meetlike texture, or even flavour. Texturewise they have crunchy, deep fried crust that coats something that feels like mashed potatos, or rather like a thinned out, liquidy form of mashed potato. Flavourwise, they taste salty, fried…and, as you dip them into French mustard, like mustard. So really, the first time I’ve been given a Bitterballen (to be honest, the first Bitterballen I had was during the night in a Falafel shop, so there have been better ones since then), it seemed to be fried mush. It still is, but I did my homework. Ingredients (you can find a precise recipe on the wonderful blog “taste of home”. For anyone that did not grow up in the Southern American states, this kind of frying might seem quite decadent, but really, it’s also ingenious. The more you eat it, the more you want it again. 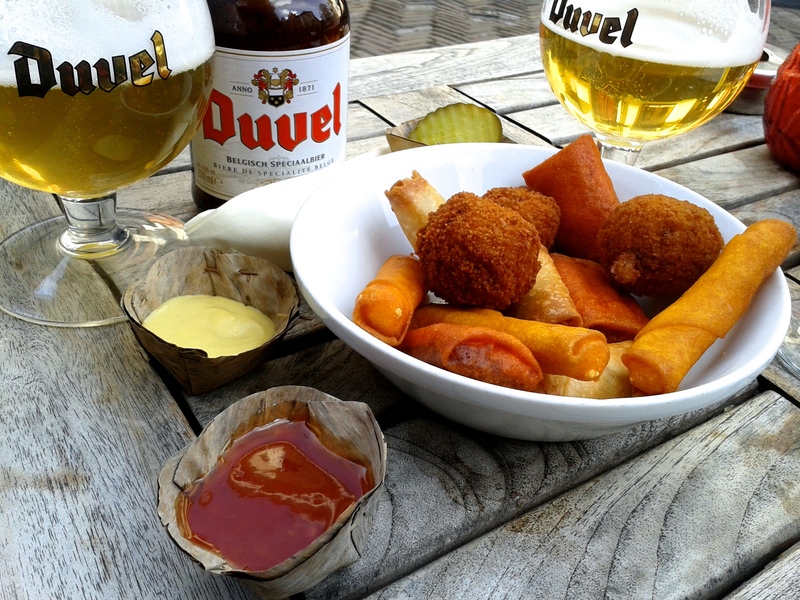 It is the perfect bar snack – and the Dutch really know their snack food. 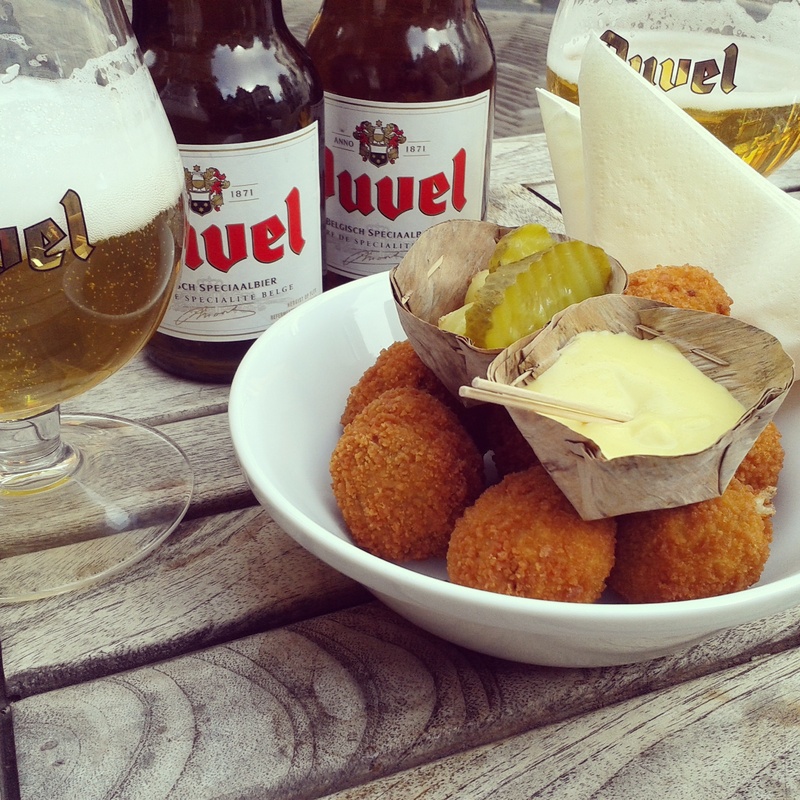 Although I am still torn whether or not a whole food culture should hinge on Bitterballen, I’ve come to think of the fried snack balls as a good metaphor for Dutch culture: a simple, comfortable, casual dish enjoyable if you get to know it and best paired with (Belgian) beer – just like the Dutch! 1. Dapp Frietwinkel – for the casual and quick fries and Bitterballen. 2. Café Olivier – for an afternoon beer of your choice paired with Bitterballen and savoured in the wonderful atmosphere of a bar-restaurant set in an old cathedral. 3. Cafe Springhaver – a small café where you can enjoy local beer and Bitterballen and practice your Dutch with the locals.